Eiito rat glue traps (Pack of 10), rodent traps sticky boards, mouse trap glue board, cockroach insects trap adhesive board by Eiito at Go Plots. MPN: Mouse board-10. Hurry! Limited time offer. Offer valid only while supplies last. Characreristics of product * This is a product that is able to capture insects or pests such as rats, flies etc with the adhesive which is applied. * This is a product that is able to capture insects or pests such as rats, flies etc with the adhesive which is applied. This method is differentiated from the existing method of capturing rats with poisonous substances. * It is an eco-friendly product harmless to the human body, of which performance is excellent compared to its price. * Install the product unfolded or bended at the corner or narrow places including wall, sink, side of drainage, and back of refrigerator where rats come out often. * It is better to put the foods on the product such as grains, etc in order to raise the capturing effect. * Install several traps at the same time in order to raise the capturing effect. * It could be less effective in capturing as there is water or oil around the feet of rat, so it is better to avoid the place where there is water or oil around or please put old newspapers or paper before it is installed. * Please install away from the place where could be reached by the children or pets. * Please avoid touching the product directly with your hand even though it is not harmful to human beings. * If the liquid adhesive is stained, first remove the water around, clean with mineral oil or vegetable oil, and lastly wash out with soup. Odourless: Peanut butter scented glue, Safe and Sanitary Rodent Rat Traps. 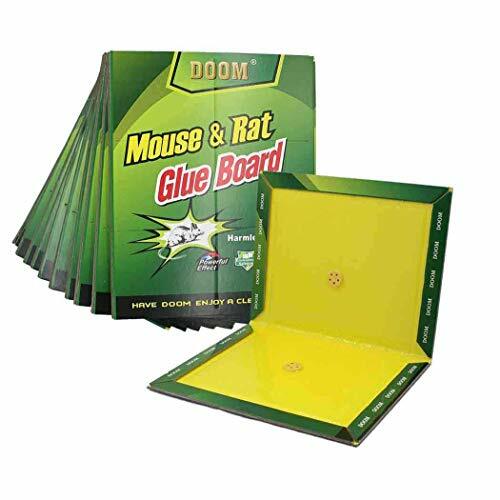 Easy and safe to use (Picture may Vary), Mouse glue traps adopted great for use in homes, restaurants, bars, offices, etc. This sticky traps also Great for Trapping Spiders, Crickets, Roaches and Other Common Household Pests. NOsquito Octenol Lure by Kaz, Inc.